Straight from the National Japan Pro-Wrestling (NJPW) come the greatest wrestlers of the Land of the Rising Sun; beware the Thunder Lyger! 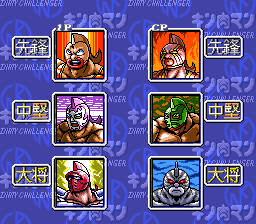 Shin Nihon Pro Wrestling Toukon Retsuden is a simple wrestling game where the player takes control of one of six wrestlers, who were current figures at the time of the games publication. 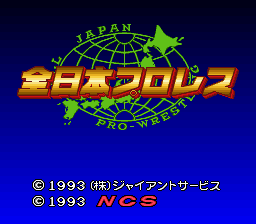 Random battles can be arranged or competition in a tournament against all the games wrestlers. 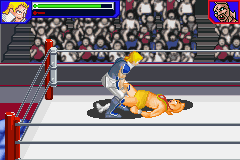 A player controls their wrestler with the directional X buttons and the A & B buttons. A & B perform punches and kicks, in close enough a punch can perform a grab. 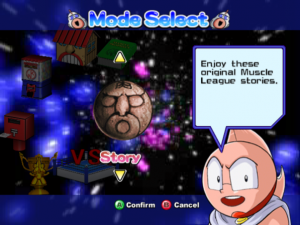 Once a wrestler is locked in a grab they can be tossed according to the directional buttons. The more abuse a character take the longer it will take them to stand up, this makes them very agreeable to kick or jump upon.